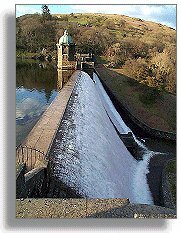 The dam at Pen-y-garreg seems like the 'middle dam' of the four dams in the Elan Valley. You can't usually have a middle one out of four, but the 'submerged dam' of Careg-ddu normally has surface water at the same level on either side, so it just looks like a bridge ! Work started on this dam in April 1895, when the new railway line was able to deliver materials this far up the valley. 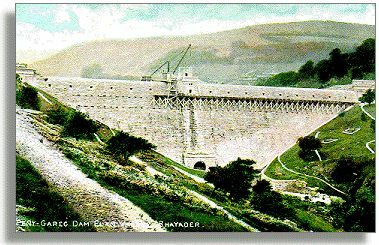 The picture below shows the dam when it was nearly finished. The track along the wall of the dam carried railway wagons and even huge steam driven cranes ! There is another view of this dam under construction on another page. The row of openings you can see near the top of the dam wall are 'windows' to a tunnel which is used to get to the valve tower in the middle. You can see this tower in the top picture. When the reservoir is full the water pours over the top past these windows, and it is like looking out from inside a waterfall !